Feel free to create a "notebook" from these items. And YES, the stuff does work, if you work it! Don't forget to follow us on Facebook, there's many articles and photos that are worth checking out. Congratulations on your new puppy. Sometimes these types of gifts don’t work out. Not all dogs, breeds, or lines will function as intended. Now’s the time to set the groundwork for many things to come in your puppy’s life and the expectations you have for it. A safe bet is to use an exstablished club with folks who have a proven track record. This is your FOUNDATION! First and foremost is the training venue, you then need to understand the training, keeping lessons short is a start. This will apply to both the humans and any dogs already living there, “the pack members.” Watch what is going on and don’t allow humans or other dogs to dominate or be rough with the new puppy in any way. It’s looking to you for food, safety, and protection…make sure this is what you’re giving it! Never allow children to treat the puppy like their very own bean-bag toy. Accidents which happen now can build mistrust later in life. Use this time for valuable teaching moments, I call them walk and talks. During this time, walk and talks allow the puppy to get use to your voice, your facial expressions, and what you expect from it. This is also a great time to introduce it to the new environment. Environmental training includes any awareness to the inside and outside world. The puppy will learn to trust your directions as you help it navigate through the woods, field, and marsh. Trips down the stairs, hallways, and slick flooring should all be met with care. Spending these short periods also gives it some much needed exercise and an introduction to the nasty leash and collar. I like short piece of para-chord tied to a collar. The puppy can drag it without the danger of getting hung up on obstacles. The K-9 “newbie” should have a veterinarian check it over and have it on a shot and deworming schedule, as well as, heartworm and parasite control medications for the life of the animal. A good vet is worth their weight in gold. When I have major events come up at our kennel, I can count on getting in right a way. 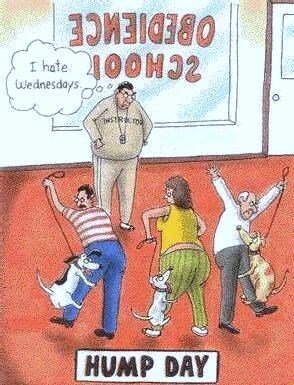 I have heard of far too many cases where dogs hated going to the vet. Muzzle the dog, medicate it, hog tie it…all for a simple shot! Everything should be positive and I’ve found that food during injections helps distract from that issue. Forget formal training for now. Teach your puppy to come when called, a simple “sit” and “down” for control work and “kennel” when you start crate training. The rest of the time should be spent enjoying the new bundle of fur. If the puppy is living inside, like with kids, bombproof the house. Anything that this little one can get into and cause issues should be reviewed. Start the New Year off Safe and Fun! Dogs communicate in many ways, one of which is non-verbal. As a handler, we do the same through the use of the leash and collar. Why do some dogs seem to be more respectful of the handlers? This could be from what is “communicated” through the leash. As pack animals, dogs showcase body positioning to communicate leadership and submissive roles within the pack. The three “Es” are used to communicate many different messages: the ears, the eyes, and the erectness of the body. These areas showcase non-verbal messages to others in the canine world. As a handler, we communicate messages by way of the leash. Sometimes without meaning it, we put our dogs into positions with the leash that they would not normally go, like fear or aggressive modes. As a pack leader and a trainer, it is YOUR responsibility to properly communicate to your dog those wanted and unwanted behaviors. Dogs look to the handler for guidance, direction, and safety. I have seen handlers use too tight of a leash and this puts the dog in a corrected position. The dog has no idea why it’s being corrected, only that this is what has come from “headquarters,” the handler. It shouldn’t shock folks that this unfair “adjustment” may give rise to why some dogs come up the leash at their handlers! Improper leash use seems to be one of the reasons new handlers have problems with dogs and dog training. When the behavior is correct, the leash should be loose; when there needs to be an adjustment it should be tight or popped. Proper handler training helps to fine tune this issue and other minor problems. Handlers who are made aware of their mistakes can now develop a better role position with their dog. 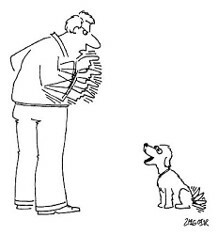 The dog will trust the handler's non-verbal message. If the dog moves out of position, a slight tug backwards communicates to the dog that a proper reposition is in order. Communications from the handler should not always be done in silence. Speak goods words to your dog while you’re training, they will soak up the praise and will want to work harder for you. Believe it or not, dogs really want to please. It takes some effort on the handle’s part to communicate to the dog the message for the day! What do you need for training? For starters, you don't NEED every tool that the pet stores sell. If your pet works well on a flat collar and 4' leash, then that should be enough for starters...as you progress in training, the items below are great TOOL BOX pieces to own. These items include: the padded harness, 3', 6', and 12' leashes, 6" or 12" leather or cloth reward tug, stainless steel pinch collar, stainless steel fur saver collar, 1 1/2" leather working collar, and a 12" traffic tab. Additional equipment can be: a cotton nail bag for obedience treats, a training vest with many pockets, a 33' tracking line, and a ball on a rope. If you have to beat the dog or "fry" it to make it work, then you don't have a clue in how to train! Heavy handed training seldom got the job done or got it done well. The old school of YANK AND CRANK isn't practiced here. Positive marker training is our only approach. I’m from the old school of dog training, the old way of doing it was "I say and you do." 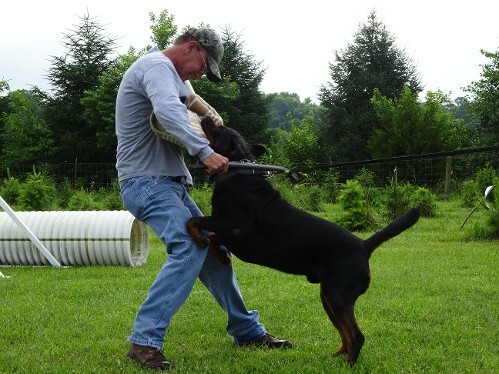 Several years ago, I changed to using verbal marker training with our personal protection dogs. Marker training is really nothing more than operant conditioning; the behavior equals the consequence/reward. It’s the same type of training used at places like Sea World. The basics of the system use a few words and rewards for behaviors prior to the BIG REWARD. Marker training acts like a “bridge” between the time something is done, a sit for example, and the reward to be given, a ball or tug. It fills a training time void. I've seen very hard dogs use it and produce great results. I know some dog trainers may be saying, “I’m not going to do some sissy bait the dog training” or “I’m not training my dog with food treats.” My only reply to that, “Are you still buying milk for ninety-five cents a gallon?” Training techniques change and wise dog trainers don’t stay in the same old system IF something else can save them time and money! Verbal marker training uses a few key words: Ready, Yes, No, Good, and Done. Ready is the term used to have the dog’s attention focused on the handler. School’s in session and now it’s time to pay attention. Yes means you agree with the behavior the dog has shown. No means you disagree with that behavior and the dog should change it. Good means you like what the dog is doing for you, keep it up. Done is a term to bring the training session to and end, a closure remark. Geeze, it’s that simple? Not yet. You do need a high value food reward, bait or the “check” to pay the dog with when they showcase the proper response. This is something the dog doesn’t get on a regular basis and has a high value to it. Some of our handlers use chicken, liver, steak fat, hotdogs, pepperoni, or string cheese. If the dog doesn’t like the food, then the value of it is ZERO! Each piece of bait must be cut about the size of a pencil eraser, small. When given, you ONLY reward with a small amount of food, this isn’t an all you can eat buffet here. If they spend too much time chewing the food, they either have great table manners or the food reward is oversized. I want to see training and not table manners. If the dog is out of position, I tell them, “No” and then give the dog a chance to reposition on their own without handler assistance. When the position is correct, I reward it with a “Yes” command and quickly offer food. As the training continues and assuming it goes well, I will say, “Good” so that the dog understands their efforts are acceptable to me. When we close the lesson, terms like “done” or “finished” inform the dog that this lesson is over. When we do protection training and the reward is a bite sleeve or jute tug. It’s given after you finish. For retriever work, I would offer the bumper or a wing and string to fetch. “What if the dog doesn’t do what I ask/command of it?” Don’t reward bad behavior and don’t be slow when you offer your rewards for proper behavior. Otherwise all you’re doing is feeding the dog and they haven’t a clue as to why this great meal is being shoved in their face. Time and timing are very important. As I said before, when using verbal markers, the dog must understand the command AND the time of the reward must correspond to THAT effort. Voice command is everything. If your praise is too harsh or too deep, it will sound like a correction. Guys this means you need to lighten up the tone and give the dog a girly voice. I know it sounds stupid but I’m telling you this works. When done with the type of dogs used for police work or K-9 personal protection, it WILL work for waterfowl hunters as well. It does require a new mindset and a willingness to allow the dog to self correct and take charge of their “paycheck.” This technique is far different from the old school style of “yank and crank” or pronging the life out of them until they get it. I’m not a fan of the mechanical clickers. I want the dog to understand my voice tone and the voice means different things with each venue. When you use a mechanical clicker, the sound stays the same, that’s its advantage. When adding the verbal marker training to the leash and collar lessons, you should see great gains with basic obedience and with those advanced lessons. For those with a new puppy or even older dogs, marker training will make you a believer too. Plan on doing short lessons and don’t be thrifty with the bait. It’s like a bank account, if you don’t put something into it, you never get anything out of it! Communication and Training...A Clear Understanding! Some folks love to cast blame in any direction but their own. "The reason the dog doesn't have better manners, it's someone else's fault...the breeder, the spouse, or the former trainer." The DGSDC feels that new starts, start here. We're of group of working dog owners and trainers who are willing to help you better understand your working lines dog or puppy and how to best train it. Understanding how the animal learns, marking the behavior, and rewarding the effort are the elements of good training! It starts with your TONE. What type of voice tone are you using to command a behavior to your puppy? If the voice is rough and loud, it might sound to the puppy like you are upset with it. Keeping voice tones light and positive is the way the DGSDC teaches success to its members and their dogs. Handler voice tones which are soft, yet firm, showcase pack leadership to the puppy. All is well because mom or pop are in control. You control each lesson by the tone of your voice. Voice tones are also used for marking positive behaviors, like mechanical clickers, and voice tones indicate that the rewards being offered are for proper behaviors. Who would be willing to work for someone that always has a loud and demanding voice? My bet, the employees wouldn't stay there very long. Everyone loves a positve boss!!! I feel there are five main areas all trainers or dog owners should be aware of when doing any form of training. Without one, the rest can fail or set you back in your training efforts. These could be viewed as: Knowledge, Timing, Rewards/Corrections, Consistent Effort, and Patience. You can always add others to this list, but these should be viewed as the top five. As a retired high school vocational teacher, I always made sure I was more informed about a subject than the students. I’ve seen too many rookie teachers get “used” by their students just because they didn’t know what they were talking about. Mastery of that unit should seldom happen, there’s always room to adjust it or make it better! This same mindset works for dogs. In the hands of a good teacher or trainer, knowledge can build interest and increase drive towards the subject. When young minds enjoy it, they will come back for more. The great thing about most dogs is that they want to please their owners. The pleasing part can be ruined however by those trainers who don’t understand how to teach, demand too much, require it too soon, or don’t understand how to build on each consecutive lesson. We all work from the same shortfall with our dogs, a lack of full understanding of the language each uses; we don’t communicate in the exactly the same manner. Sure we can come close, but some days close might as well be a mile away. For training purposes, the best place to start is the one called the beginning. In the beginning, assume for a moment that your dog knew everything; if they did there would be no need for you as their trainer. Why do some dogs or puppies fail to understand the lesson for that day? One reason may be that prior knowledge was missing. Without a past history of an activity, you have nothing to build on and it can’t dovetail into the current area of study. Fact: most retrievers like to carry things in their mouth and are willing to work for their owner. Many will go crazy for the game of bumper baseball. If you’re having training issues with your dog, it’s your fault and not the dog’s. Keep the knowledge and training segments SHORT. Less is often times more. A few well planned bumper tosses and positive verbal praise on the return trip are much more effective than hundreds of poorly done ones. Remember this point too, timing is everything. Timing and rewarding the effort increase drive, drive continues when the lesson is fun and productive. Drive and desire are like the wood in the stove; they heat the passion of the event. My dogs will push for more. Sometimes you have to know how to say, “Enough” or “Done. Handler verbal communication done at the right time also creates a powerful bond with the dog. The last thing you want is a dog that knows how to retrieve, but the handler or trainer is killing the drive by expecting too much in the early stage. This area of timing has to make sense, like asking a first grade to do algebra, it isn’t happening. I’ve never met a person yet who enjoyed working for a controlling and screaming boss! Reward the effort at just the right time and keep those sessions short. How can you correct something that you haven’t taught? 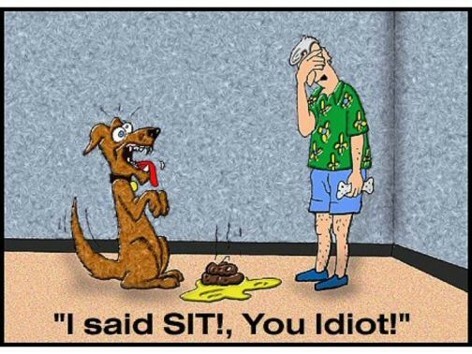 I get calls from folks who say, “My dog knows the sit or come command but isn’t doing it.” Well, if they know it, they should be doing it. If you haven’t taught it, do you think the dog will just go out and learn it on their own? Rewards go hand in hand with marker training. Rewards can be anything of value to the dog. Some dogs work well for praise from the owner, others work better for food or bait, and still others are object fixed…they love toys, wings, or bumpers. The thing that has the highest reward value is what I always use. Corrections are not the same thing as punishment. Corrections are either verbal or physical redirections, commanded of the dog for their change. Trainers or handlers never make the change, if you do, YOU work for the dog! If you were using verbal maker training, you might command, “NO” and this bold directive may be enough to fix an issue. Sometimes you need to go back to the leash and collar. A simple tug reminds the “friend” who is the boss. For headstrong dogs, I’ll use a German prong or pinch collar. This bites the neck skin and sends a crisp message to the dog, “Stop messing around!” I have used one on Border Collies, Labs, Giant Schnauzers, German Shepherds, and other breeds. It is like a low level e-collar; it works best when used with a controlled hand and not a controlling hand. Consistent efforts are just that, the same all the time. One day we train in a haphazard manner, the next is like a military DI, the next is like someone’s mom, and other days it’s a regular schedule. No way! So why’s then is your dog’s head all is messed up? The efforts haven’t been consistent. The same can be said for rewards and corrections in the beginning stages of training. If you feel like rewarding you do, if you feel lazy you don’t bother cutting reward bait…why? You must be consistent if you want your dog to be that way. Have a training game plan: short retrieves, water retrieves, blinds, doubles, tall grass, call offs, make the list and keep it real. There should be nothing trained without a fair prior experience and short new lessons. If the dog doesn’t bring the bumper to hand, figure out why or stop training for that day. It could be the dog just isn’t feeling well. We all have our Mondays. Each lesson must have the same consistent demands of the dog, the rewards and corrections must be issued in the similar manner, and closure of the lesson means WE ARE DONE. When all else fails you must be patient. Things do come together in their right time. Patience…I left this for last as it’s something I always have to work on. Patience is the understanding and loving hands of a Master Trainer. Patience takes 80% of the good and continues to improve on the 20% that is lacking. 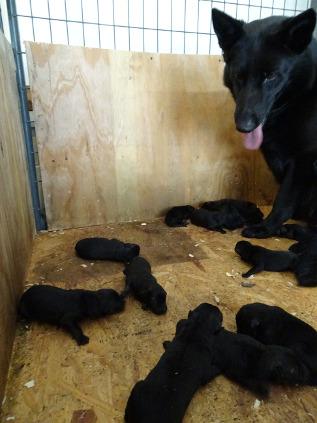 It also allows young puppies to grow up and make mistakes. This is a preaching topic all in itself! Dogs, like humans, have good days and bad ones. Being a wise trainer means you know when to cut your losses for that day. There’s nothing wrong with putting the dog or puppy away for a few hours or even the day and cooling down. Growth stages or maturity levels can influence how an animal trains and works in the field. Wise teachers will learn how to read their animal’s emotions and change the “game plan” for the better. While time lost can never be recaptured, poor training can set you back weeks or even months in the hole. Breathe in, breathe out and don’t stress the small stuff. It will all come together in its own time. Count them, FIVE AREAS for you to work on. You can do it! 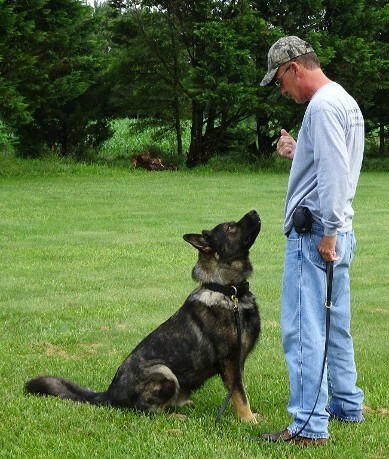 These are the dog training commands we and others use with our German Shepherds. Some folks use Dutch commands but this is more common in the Law Enforcement venue and with the Belgian Malinois breed. Heel Fuss Fooss (long o sound as in moose) Frequently gets conjugated as if it were an english verb, as in "Did you see him fussing with his dog?" Here (or Front, or Come) Heir hee er Hang on the "eh" sound slightly longer than usual, and roll the r (if you can). Bring Brrring. Roll the "r"
Search, Seek, Track Such Tsuuk, soo, The final k sound is almost silent. Out, Drop it, Let go Aus Owss, rhymes with "house"
Jump, Up, Over Hopp Hop. Go on Voran For awn. Some people use "voran" as the command to the dog to run to the blind and search it for the helper, others use "revier".